Tide Brand Pods, $4.99 ea. $1.99 each wyb 3 after coupons and points! Tide Brand Pods (12-16 ct.), $4.44 ea. Tide Brand Pods (12-16 ct.), $4.94 ea. 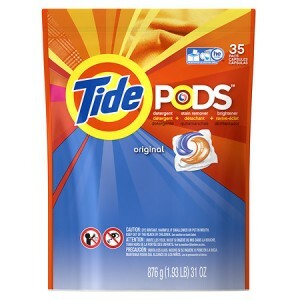 Tide Pods (20 ct.), $5.99 ea. $2.74 each wyb 4 after coupons and points! $2.50 wyb 2 ($1.25 each) after coupon, points and rebate! 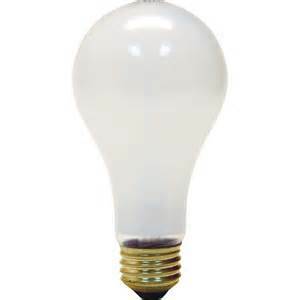 GE 150W, 120V Incandescent Light Bulb (1 ct.), $1.99 ea. GE Soft Halogen (4 ct.)/Reveal Halogen (2 ct.)/LED (1 ct.)/Bright Stik LED (6 or 10 watt 2 ct.), $7.99 ea. FREE (+ $2.00 money-maker) after coupon and points! GE 40W A15 Appliance Bulb, $1.99 ea. 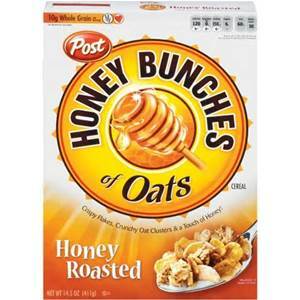 Post Cereals (Honey Bunches of Oats Cereal and more), $1.99 ea. $1.24 after coupon and rebate!